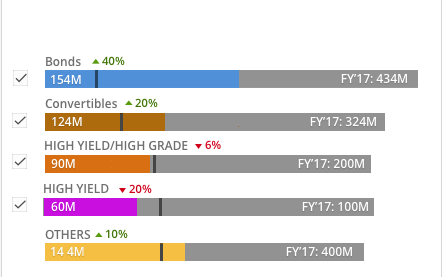 Working on a revenue piece where I have to show current YTD ( Year to date ) performance with last year’s YTD and the total revenue last year for a specific product. The below image shows the current design. User tests suggest that majority users are confused and it does not serve the purpose of quickly glancing over how their products are performing. The issue with the ideal scenario is that, I don’t have a lot of vertical space to work with. And the same bullet graph needs to be used again to be consistent with overall design. 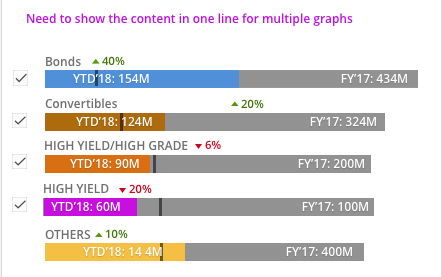 Some cases might use multiple graphs stacked. I tried working with Bullet graphs and although they look like a decent solution, they kind of mess up at the end of year. I mean it still works and maybe that is the solution, but I’m not entirely convinced. Would like to know if anybody faced similar issue and found a solution. Thank you. What matters in bullet charts of this nature is to give an indication to the business user that things are as expected or need to be examined more carefully (whether for good or bad). One question that needs to be asked is - does the data need to be displayed or could a rollover, or "Display Data" work? 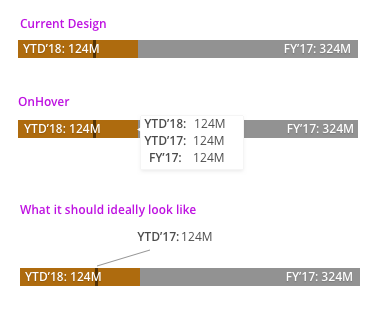 If all the data is required I would recommend removing the YTD'18 and left align the data to make it more scanable. In addition I would highly recommend showing the users an example without all the data. It's cleaner and far more scannable especially on a busy, cluttered screen. 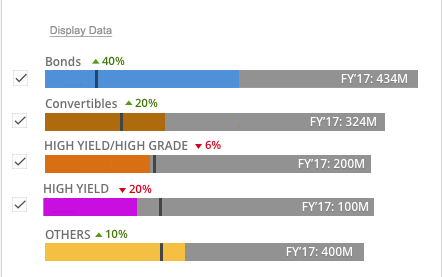 If they want to see additional data let them select the "Display Data" toggle and to display the YTD values. Not the answer you're looking for? Browse other questions tagged info-visualisation charts progress-bar graphs financial or ask your own question.